When 2014’s RAZOR WIRE trickled into bespoke listening environments in the UK and Europe, little did we realise that this was the start of an intense love affair between Hannah Aldridge and a growing legion of admirers this side of the Atlantic. Subsequent tours encapsulating many shows and festival slots have fuelled this growth which is set to burn a lot fiercer with the release of the follow up album. As indicated by Hannah at her shows last year, the new record would see a shift to a rockier sound and GOLD RUSH absolutely does that, failing to disguise any subtle change of direction. Regardless of any intention to rely solely on a heavily plugged-in amplification, the term rock is moderated by Hannah’s southern sensibility which will always inadvertedly draw influences from a wide pool of styles. This is what makes her music special and accessible, whether you approach it from an alternative, folk rock or alt-country starting point. The ten tracks which form GOLD RUSH are a neatly packaged spread of songs that will feel equally at home given the full band big stage treatment, or more likely on European shores, a stripped back yet no less intense airing. Indeed a fair number of the tracks have already been heard in a live setting as circumstances dictated that the route to market for this record was never going to be an easy short term ride. Perhaps the desire to get this material out is reflected in the gritty determined feel that accompanies track after track. Amidst the crashing guitars, lie a fascinating set of songs uniting the deeply personal with the interestingly narrative, creating a rich texture which resonates well with folks who take great delight with soaking up the vibes from a strong album. Without any hesitation, the recommendation is take this record with a major dose of the live show to enable you to understand further the psyche of Hannah Aldridge – the impassioned artist. Every dominant record needs to be able to call on premium moments to carry it through a minefield of competition and critique. ‘Burning Down Birmingham’ plays that role here right from the cutting lyrical admission of ‘I’ll take my heartache with a little bit of ice’ to its overall desire for first degree revenge. Of course it possesses an essential strong chorus, an exciting feature which threads across many of the tracks. Two initial numbers which back up this view include album opener ‘Aftermath’ and ‘The Irony of Love’. The former gets the record off to a cracking start with Hannah setting out her stall in the line ‘I was born in a crossfire, I was born with my pants around my neck’. The rest of the track will get your foot stomping , head rocking and heart pumping. However by the time we reach the other track at #4 the mood and tone is tempered with a more measured approach. 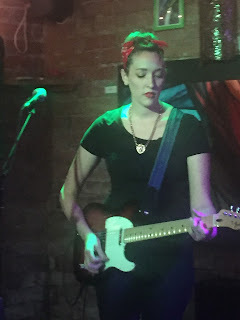 Those with a little background knowledge of Hannah will be aware that she has written material pitched to the horror genre and this style briefly interjects the record in the scary undertones to ‘Dark Hearted Woman’ and the haunting – almost broody – mood attached to ‘Lace’. This is an enticing aspect to Hannah’s work which can in some respects liken her to Lera Lynn but in a more fiery capacity. You always get the impression that any record credited to Hannah Aldridge will be a no filtered or watered down version of her feelings. However she doesn’t shy away from enlisting help, to the extent of crediting the work of Jordan Dean in the opening track title and to Ryan Beaver later in the record for featuring on ‘Living on Lonely’. 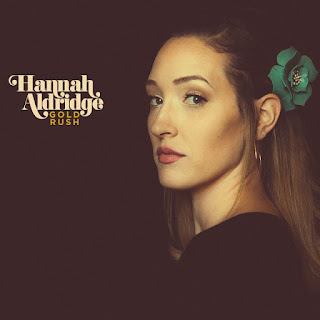 Further investigation into the making of this record revealed that Hannah enlisted the help of her father, Walt Aldridge (the famed Muscle Shoals and Nashville songwriter) to seal the production. A wish one day would be for Hannah to present her music live with full band accompaniment on foreign shores. In readiness for this evolution, the indie-rock tinged ‘Shouldn’t Hurt So Bad’ complete with seriously sound guitar segments, and the driving beat laden heartland rock number ‘No Heart Left Behind’ are ripe for elevation. As not to leave the inevitable ballad out, ‘Gold Rush’ plays that card here in the role of both album title track and closer. It is perhaps the closest Hannah gets to letting her country DNA seep into the record. She will make an absolutely storming record in this genre one day, but not in 2017. ‘I Know Too Much’ is the final song to warrant a mention, possibly because it is a blended track which exudes the overall feel of the album rather than dictating it. There is often a scenario where a track can raise its awareness ten fold when exposed in a live setting. This may or may not be the case with this song, but multiple listens still keep it on the periphery rather than at the core. Good things come to those who wait may be sauntering into cliché territory, but GOLD RUSH repays the patience of existing fans in plentiful portions. Its strength is a testimony to the way that Hannah Aldridge goes about making music. No half measures, plenty of passion and a cutting edge that frames the message so vividly. This record extends her talent, seals the initial promise of 2014 and points the way forward for an artist who is a key architect of Americana music across the boundaries of its horizon.